A regular event for many football collectors, 2017 Panini NFL Stickers Collection proves not everything in today's hobby is unaffordable. The low-cost stickers chronicle the NFL lineup with strong overall coverage of the league. Every pack includes seven sticker cards. 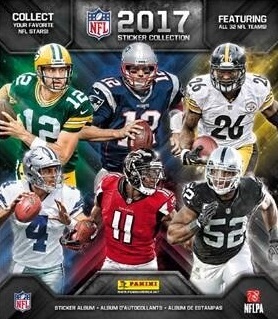 As has been the case for years, the 2017 Panini NFL Stickers Collection checklist visits all 32 teams with almost 500 cards in total. Among these are over 100 foil options. Although values are normally low, so is the price, and that is the intent. Appealing to entry-level collectors or those just looking for a simple experience, the set works with the same format that makes the World Cup stickers so popular every four years. Collectors can display and organize their stickers in a custom 72-page album normally sold alongside the sticker packs. The full-color sticker album features two pages for every team. In addition, there is space reserved for a summary of the 2016 NFL Playoffs and the Super Bowl LI matchup between the Atlanta Falcons and New England Patriots. Reaching into the past and future, the 2017 Panini NFL Stickers Collection album also has pages for the Pro Football Hall of Fame Class of 2017, and the 2017 NFL Draft.